A strong field will assemble at Dundonald Links this week to do battle for the Scottish Open title. Alex Noren defends and Rory McIlroy, Henrik Stenson and Rickie Fowler will all start. As the world’s top golfers look towards next week’s Open Championship at Royal Birkdale, many have chosen to compete in the Aberdeen Asset Management Scottish Open on the links at Dundonald this week in preparation. Rory McIlroy will play in the Scottish Open and will be looking to bounce back from a disappointing missed cut in the Irish Open last week at Portstewart. Last year’s Open champion Henrik Stenson will be aiming to rediscover his best game as he looks towards his defence of the Claret Jug, while his fellow Swede, defending Scottish Open champ Alex Noren will be aiming for another win on the Scottish coast. Other big name players in the field at Dundonald include Adam Scott, Matt Kuchar, Patrick Reed, Tyrrell Hatton, Bernd Wiesberger and Rafa Cabrera Bello. As the fourth event on the European Tour’s inaugural Rolex Series, there’s a big prize fund on offer this week – $7,000,000. The winner will receive over $1 million. The Scottish Open was first contested in 1972, the first year of the European Tour; England’s Neil Coles was the winner. The tournament disappeared from the schedule after 1973 but it was re-established in the 1980s. For eight years the competition was held over the Kings Course at Gleneagles with winners like Ian Woosnam and Jesper Parnevik. There were then two years at Carnoustie before the event moved to Loch Lomond in 1996. After 15 years at Loch Lomond, from 1996 to 2010, the Scottish Open spent three years at Castle Stuart where Luke Donald, Jeev Milkha Singh and Phil Mickelson were victorious. After visiting Royal Aberdeen and Gullane, the event returned to Castle Stuart last season where Alex Noren came out on top. 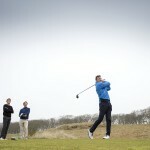 Dundonald Links is a new venue for this year’s event. Kyle Phillips, the man responsible for designing the layout at Kingsbarns, created the course at Dundonald and, much like Kingsbarns, it’s a sympathetic modern take on a classic Scottish links. There’s an eclectic selection of holes on the links that will test all facets of the game. Long par-4s demand strong hitting while shorter holes require a deft touch and the ability to manipulate ball flight. The course is no stranger to significant competitions. The links has welcomed European Tour qualifying, Senior Open qualifying, the Boys Amateur Championship and the 2015 and 2016 Ladies Scottish Opens. The weather forecast looks a little mixed and it could be rainy over the weekend. Rickie Fowler – The American has a creative game that is ideally suited to the links. He won this event at Gullane in 2015. He was tied fifth in the recent US Open and tied third in the Quicken Loans National. Richie Ramsay – Fresh off the back of a great tied second place finish in Ireland, the Scot will look to continue his good play in front of a home crowd. He’s accomplished at links golf. Alex Noren – The defending champion has been on good form in recent weeks. He won at Wentworth and was tied 10th in the Open de France. Key hole: 18th. It’s a testing par-5 of 560 yards. Unless the wind is helping, this is likely to be a three-shotter for most of the field. Bunkers protect the right side of the bunker from the tee and a lay-up needs to avoid cross bunkers and a trio of traps on the right side. A burn protects the front of the green which means anyone having a go in two will have to fly the ball all the way to the putting surface. It’s a great hole and one where there could be big swings at the death.